Using orbital welding equipment led to productivity gains in one of the nation’s first fusion-welded underground pipelines. Welders and those who perform welding-related functions make up nearly 10 percent of the manufacturing work force, according to the Bureau of Labor Statistics (BLS). Of these nearly 2 million workers, BLS estimates that more than 365,000 become victims of work-related eye injuries each year — nearly 1,400 a day. Work-related eye injuries also can be costly financially: One BLS report estimated that eye injuries cost employers more than $467 million annually. Formal training for welders varies. Some receive only basic training in a vocational-technical school as part of another program, while others spend several years learning and perfecting their skills. Because of this inconsistency, knowledge of hazards also varies greatly. As a result, workers who produce good welds aren’t necessarily safe welders. Molten slag and flying particle injuries typically occur when welders don’t wear safety equipment, or when that equipment isn’t rated properly for the task or is maintained poorly. Fumes, vapors, gases, and chemical exposure vary according to the metals or substances being welded, as well as any finishes, treatments, and other preparations used. The best way to prevent these injuries is to refer to the Material Safety Data Sheets (MSDS) for any hazards present in the metals or preparations. Manufacturers of these products also can be a valuable resource. Fume hoods, exhaust systems, and respirators often are necessary to keep contaminant concentrations at safe levels. UV radiation is a major threat to the eyes. Because UV rays aren’t visible, exposure can go undetected. Photokeratitis, commonly know as welder’s flash or arc eye, results from overexposure to UV radiation from welding and can occur even if exposure is limited to a few seconds of looking directly at a welding arc without eye protection. This condition causes the cornea to swell and also can produce pain, sensitivity to light, and tearing. Repeated exposure can cause permanent eye damage. Cataracts also have been linked to long-term UV exposure. Welders’ masks now are available with a sensor that immediately turns the lens from clear to the proper shade when an arc is struck. The Occupational Safety and Health Administration (OSHA) says that exposure of the eye to intense visible light can produce adaptation, in which the eyes make changes to try to ward off damaging arc rays; pupillary reflex, or a contraction in the diameter of the pupil; and shading of the eyes. These responses are the eyes’ protective mechanisms to prevent excessive light from focusing on the retina. During arc welding, eye exposure to intense visible light is prevented mostly by a welder’s helmet. However, welders can sustain retinal damage if they carelessly view an arc. At no time should anyone look at an arc without eye protection. Going beyond helmets, though, OSHA requires that welders use engineering controls to combat hazards before they receive personal protective equipment (PPE). For example, magnetic and clip-on shields can help reduce the amount of sparks, slag, and particles reaching a welder’s face. Even with these precautions, however, PPE is necessary. One form of head protection often isn’t enough. Safety glasses or goggles in combination with helmets are necessary for adequate protection. Safety glasses and goggles need to be fitted with side shields to protect eyes from indirect UV rays. For workers who wear corrective lenses, safety glasses and goggles can be fitted with prescription safety lenses. If workers perform duties near electrical systems, care should be taken to choose frames with no metal parts. Regarding contact lenses, OSHA, the American Welding Society (AWS), the U.S. Food and Drug Administration (FDA), and the National Safety Council (NSC) all acknowledge that wearing contacts while welding is safe in many cases, unless fumes, excessive particles, or other regulations bar their use. Contact lenses, however, don’t serve a safety function; welders should wear goggles or glasses with contact lenses to ensure proper eye protection. In addition to protecting the welder, employers also must be mindful of others who may enter welding areas. OSHA requires signs to be placed in areas where employees might encounter a hazardous situation. Such signs should be appropriate for the potential hazard and should list any PPE necessary in the area. 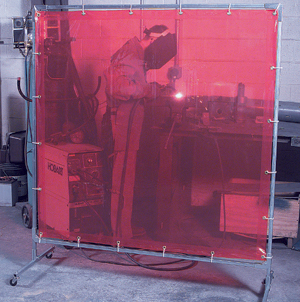 Nonwelders also should be protected by screens, curtains, or shields that enclose the welding operation and help filter welding light, radiation, sparks, and particles. Fume hoods placed near the operation also can help draw away hazardous gases. To be efficient, safety glasses or goggles should fit snugly and be comfortable under the helmet. A flameproof skullcap is another desirable piece of protective equipment that protects a worker’s head and hair from sparks and heat. It’s also necessary that the lenses in welders’ helmets have a shade appropriate for the work performed. According to OSHA, a general rule for selecting filter lenses is to begin with a shade too dark to see the welding zone. Then try lighter shades until one allows a sufficient view of the welding zone without going below the minimum protective shade. OSHA’s 29 CFR 1910.252 lists minimum shade requirements for a variety of welding operations. American National Standards Institute (ANSI) Z87.1 also lists recommendations for safety. OSHA requires employers to make employees aware of hazards in their work environment. Welder training should acknowledge hazards and list the proper procedures to follow when welding. It should instruct workers on how to choose the proper shade for their helmets and teach them to drop their helmet before they arc. It’s important to discuss proper use and maintenance of PPE. All items should be inspected before use. If lenses are scratched, pitted, or cracked, they should be replaced. Goggle straps that are knotted, twisted, or stretched also should be replaced. If checklists or other documentation is used in training, it’s imperative that they use clear language to explain the hazard. Possible consequences for not complying with the standard should be included, as well as methods to avoid the hazard. Welders should learn basic first aid for eye injuries so that they are prepared if an accident occurs and more receptive to efforts others make to help them. For example, if something becomes embedded in a welder’s eye, the item shouldn’t be removed until medical help is available. However, if the irritant is a small particle of dust or a chemical splash, flushing is recommended to remove it quickly. Using the proper PPE should lessen the chance of injuries, but knowing what to do based on the type of emergency is equally important and can make the difference in saving a worker’s sight. Remembering and implementing these basics will help lessen the chance of injury and promote welder and workplace safety. Karen D. Hamel is a technical specialist at New Pig Corporation, One Pork Ave., Tipton, PA 16684-0304, phone 814-684-0101, fax 814-684-3396, e-mail karensp@newpig.com, Web site www.newpig.com. New Pig Corporation markets and develops technology for environmental responses to industrial leaks and spills. American National Standards Institute, 1819 L St. N.W., 6th Floor, Washington, DC 20036, 202-293-8020, www.ansi.org. American Welding Society, 550 N.W. LeJeune Road, Miami, FL 33126, 800-443-9353, www.aws.org. National Safety Council, 1121 Spring Lake Drive, Itasca, IL 60143-3201, 630-285-1121, www.nsc.org. Occupational Safety and Health Administration, 200 Constitution Ave. N.W., Washington, DC 20210, 800-321-6742, www.osha.gov.